Once, a newly wed young man called Vinod went to his in-laws' house to pick his wife Seema and bring her back to his own house. His in-laws were very superstitious and said that the planet venus, the planet of love, was not in the sky and therefore, it was not a suitable time for the couple to start their married life. But Vinod was adamant. He thought that he knew best and refused to listen to their advice. Soon he set off for home with his wife. The journey was very long and tiring. 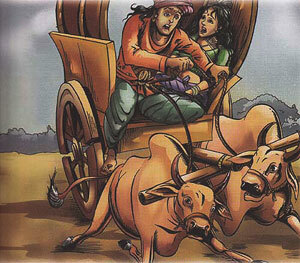 Hardly had the couple left the town, then their bullock cart broke down and their bullocks got injured. They had no other option and continued their journey on foot. Further on, some robbers attacked them and stole all their money and seema's preceious ornaments. They somehow managed to save their lives and escape from the robbers. Before they reached their destination, Vinod fell very ill and they couldn't continue on their journey at home. When Vinod's parents came to know what had happened they asked him to return to his in-law's house with Seema and come back with her when Venus rises. Vinod realised his mistake; he did as his parents told him and went back to his in-laws' house and waited there for an oppurtune time to come back to his own house. Thereafter, Vinod and Seema lived a happy married life.